Electric Cars CO2 Emissions: Are EVs Greener Than Fuel Vehicles? Typically, electric vehicle drivers try to do something good for the environment and to pollute the atmosphere as little as possible. Hearing that charging an electric vehicle also pollutes CO2 concerns a lot of potential EV users. The energy needed to produce the car itself, and especially the battery. The energy used to produce the electricity to charge the vehicle. But how much CO2 is saved by using an EV compared to a fuel consuming vehicle? The answer to the question, of how much CO2 is emitted, depends on the country you are charging your car in. The CO2 amount depends on the CO2 emitted for the electrical energy, which is charged by the driver. If the driver charges in a country with a high amount of renewable energy like wind, solar or hydro energy (e.g. Norway), his or her charge leads to less CO2 pollution than in a country, which depends to a high percentage on coal plants. The diagram shows an example of the diversification of the energy supply for a country. The grey energy sources (Biomass, Mineral Oil, Natural Gas, Hard Coal, Lignite) are sources, that pollute CO2. 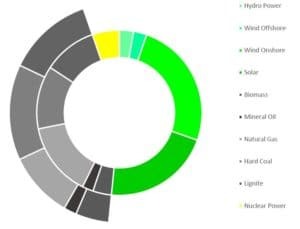 The diversification applies for the average kWh over a year. In this example, circa half of the produced energy does not pollute the atmosphere with CO2 (Hydro Power, Wind Off- and Onshore Power and Solar Power). 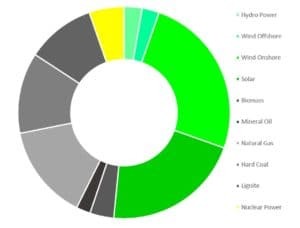 We highlighted Nuclear Power in yellow, because it does not pollute the atmosphere with CO2 but comes with other downsides concerning many EV drivers. Among the energy sources that pollute CO2, the sources differ in regard to the amount of polluted CO2 per kWh. This is shown by the outer circle in the following diagram. We can see for example, that coal plants pollute more CO2 per kWh than Natural Gas plants. The table gives the CO2 pollution for each energy source. In our example, the CO2 pollution for the average kWh is 127 gCO2 /kWh. This average can be taken into account when you want to calculate the amount of gCO2 / km. How much CO2 do I save when driving an EV instead of a fuel vehicle? To answer the question “How much CO2 is saved by driving an EV”, we can compare this number with the gCO2 / km polluted by a similar fuel-driven car. To make it easier for you, we have a calculator doing just that for the different countries. And thereby helping you, to get a feeling for the size of your carbon footprint and how it could change when driving an electric vehicle. Here we should keep in mind, that with home charging stations, that can be programmed regarding the charging time. The times, in which solar or wind energy is cheap, can be prioritized for charging. By doing this, the EVs enable a higher amount of renewable energy in the energy grid. During the production of each car, CO2 is set free, by using energy for the steel production, the energy for the production tools and etcetera. In our calculator, we focus on the CO2 emitted during driving. But you should also take into account the carbon emissions produced during the production of the EV. CO2 is a gas that leads to the greenhouse effect. The greenhouse effect describes the sealing of the warmth of the earth and atmosphere by gases and leading to a rising temperature of the climate. Governments around the world are implementing policies in order to switch from polluting energies to renewable energies. Moreover, many of them are already planning to replace completely fuel cars by EVs in the future. It will take time, but we will probably get there one day.